Second grade and first grade join together in groups twice a week for reading comprehension instruction. Students learn the fundamentals of plot analysis as they identify character, setting and sequence of events. Each reading group studies a particular author focusing on the author’s life and motivation for writing. Students compare and contrast the author’s books and draw connections to their personal lives. Each year, students read nonfiction books for their individualized science research projects. They learn how to navigate these texts using table of contents, indexes, glossaries while they practice the skills of note-taking and paraphrasing. The second grade writing curriculum is based on the 6+1 Traits of Writing program which teaches students to focus on the traits of: ideas, organization, voice, word choice, sentence fluency, conventions, and presentation all to improve their narrative and creative writing. Students do pre-writing activities to brainstorm and then use graphic organizers to organize their thoughts on paper. Students write rough drafts and “publish” a final copy of their writing to present to their classmates. Grammar and vocabulary are taught using the Houghton Mifflin’s Spelling and Vocabulary program. Students learn how to organize words into principles, patterns and parts. In the spring, students learn to read and write various forms of poetry, while learning about parts of speech and grammar. Math is taught using the ThinkMath! Program. ThinkMath! builds computational fluency through practice in basic skills as students investigate new ideas and solve meaningful problems. Students begin the year by practicing a variety of counting strategies, looking for patterns, and using number lines. Students practice finding sums to 10, compare sums to 10, write greater and less than sentences, and add and subtract with place value. Students also complete a unit on probability and data, in which they use pictographs, bar graphs, and line graphs to locate data. Second grade students then learn how to measure time on analog clocks and complete story problems with elapsed time. Additionally, students in second grade explore fractions of wholes and sets including halves, thirds, and fourths. Students complete a geometry unit where they sort polygons by attributes, look at reflections, use lines of symmetry, measure area, and examine three-dimensional figures. Towards the end of the year, second graders are introduced to multiplication as repeated addition and division concepts as well as capacity, weight/mass and temperature. The first science unit in second grade is seeds and plants. Throughout this unit, students compare and contrast seeds, observe seed germination, examine plant parts and conduct experiments. The study of plants is enhanced by the school’s state of the art Tower Garden, a hydroponic gardening system that enables students to grow fresh leafy greens and produce right in the classroom. The next unit focuses on the physics of simple machines. Topics include: force, gravity, friction and motion. Students explore how using simple machines such as levers, pulleys, wheels and axles, inclined planes, and wedges reduce the amount of force required to do work. In the spring, the first and second graders join together for a final science unit. The unit alternates every other year between “Biomes” and “Insects.” Using a variety of plants and vegetation, we build models of each biome that we study. When studying insects, we observe live critters such as crickets, ants and worms. Students conduct individualized research projects by reading nonfiction texts to study their own animal or insect of interest. Students creatively express their knowledge of insects and animals through artistic dioramas, they write from the perspective of their animal or insect and they use technology to showcase their learning. Finally, each unit culminates with a musical play and exhibition of student learning for family and friends. Throughout the year, students program LEGOs using WeDo Software and use apps such as Scratch Jr. and Toontastic on iPads to create their own stories relating to curricular content. Second grade’s first social studies unit is geography in which students learn to use map features such as: map scale, compass rose, titles and legends and how to read various types of maps. Students are able to identify Massachusetts on a map of the United States, and they learn the names of all fifty states. Next, the second graders learn about the continents and oceans and compare maps of the world with globes. The next unit is about the Civil Rights Movement. In conjunction with Martin Luther King Day in January and Black History Month in February, students are given an age-appropriate introduction to the Jim Crow Laws and the Civil Rights Movement in the 1950s and 1960s in the USA. Students learn to analyze texts and photographs from the era, debate issues of prejudice, and identify influential individuals who fought for equality during the Civil Rights Movement. For the final unit of the year, second graders independently research an influential American, learning and reporting on facts about their childhood, education, motivation, and contributions to our society. In second grade Hebrew, students acquire new tools for becoming more independent learners in both reading and writing. Reading fluency is achieved along with the ability to write in script as well as print. Using both the Tal-Am curriculum and Ivrit LaKol series, students learn new vocabulary and grammar and are encourage to speak conversationally as a part of each lesson. Second graders are introduced to short stories while they continue working on reading comprehension and written expression. Students begin learning Torah in Biblical Hebrew. They study the days of creation in the first chapter of the book of Genesis and are encouraged to connect their knowledge of the natural world with the biblical narratives to explore G-d’s relationship to the world in the Torah. They learn skills that enable them to become comfortable navigating, reading and understanding the Torah in Biblical Hebrew. Second grade students learn the daily morning blessings called Birkot Hashachar (blessings of the dawn). Throughout the year, students focus on reading prayers with fluency and accuracy as well as intentionality. 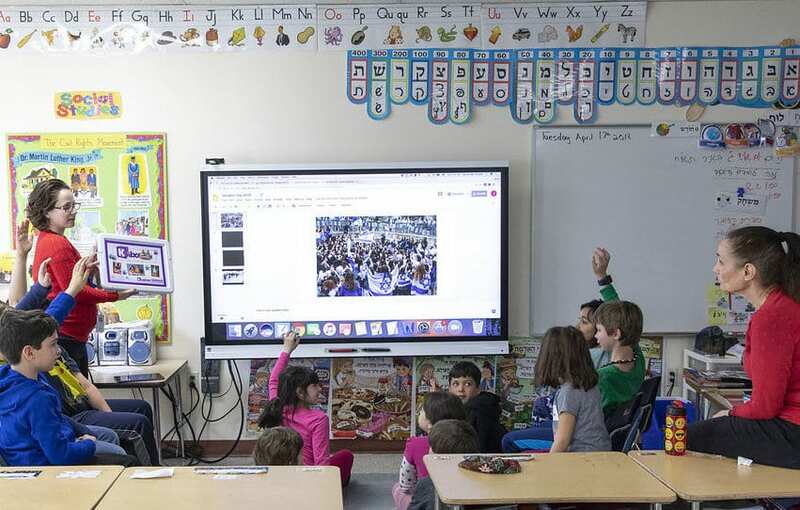 In second grade Jewish Studies, students learn about holidays (symbols, history and traditions) and experience them in school through different mitzvot. Students learn the Hebrew names of the different ritual objects, the specific blessing said over each object, and what they symbolize. The goal of our music program is for students to become skillful and enthusiastic music makers by encouraging music literacy, participation and performance. Through joyful discovery of classical and contemporary music, students cultivate musicality and knowledge. In second grade students continue learning to read music and play several instruments including the recorder. Music is integrated across the curriculum as students sing and perform to enhance understanding of subjects from social studies to Judaics. Students work with a variety of drawing tools, paints, and papers. Students learn techniques for drawing, painting, weaving, printmaking, and collage. Second graders expand their knowledge of the elements of art such as line, shape, color, and texture. Emphasis is put on the creative process rather than the finished product. Art history is an important component of the curriculum, as well. Because visual content helps children understand subjects more clearly, throughout the year, art is integrated with units of study in the classroom. In second grade students expand upon what they’ve learned in the past year by breaking stories down and working in groups to perform the beginning, middle, and end of stories. Students learn about the parts of the stage and stage directions, while continuing to create mini-scenes in groups and individually. Students demonstrate their understanding of emotions, by using their bodies to show how they feel and by using emotions to talk about characters. During the second half of the year, students work towards a musical performance, expanding upon the skills they’ve learned. Students gain experience working in an ensemble, while taking responsibility for their own individual parts. In third grade physical education class, students are encouraged to participate in low and high energy activities with a focus on physical coordination, sportsmanship, and problem solving. Students learn the fundamentals and rules of major sports, as well as physical fitness, stretching, and agility. Units over the school year include soccer, flag football, basketball, handball, strategy games, and floor hockey. Using demonstration of skills, review of age appropriate rules and scrimmages, students learn new sports, the importance of physical fitness, respectful play with others, and how to engage in healthy competition.